For a long while now, Google has been working hard to improve its smart personal assistant Google Now and to make it an important part of Android’s user interface. It has become a permanent feature of Android’s Google Experience Launcher and you can use many different voice commands to make calls, send emails and do other cool things. Talking about voice commands, Google has been adding more and more commands the last months to make your life easier. It has actually become quite difficult to remember all of them since it’s quite an extensive list by now. Yesterday, Google’s voice command factory spat out some more. On the official Google+ page, Google announced that the newest version of Search for Android allows you to text or call contacts that have a special kind of relationship to you. For example, instead of saying “OK Google, call [your mom’s name]” you can simply say “OK Google, call mom”. If no one in your contact list has been associated with that relationship, an interface will appear that lets you assign it to the right contact. 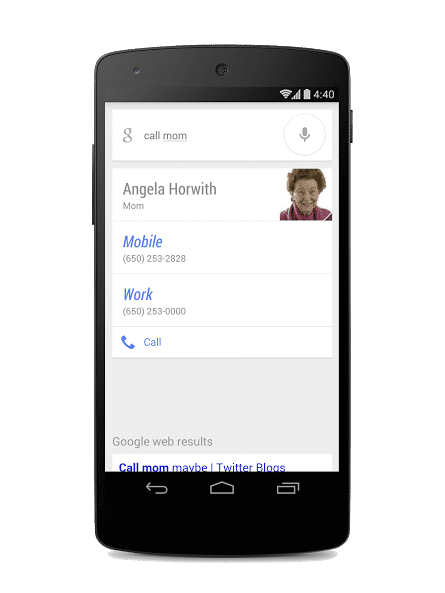 Until now, you should be able to call or text all standard family members and relationships (dad, mom, brother/sister, cousin, aunt/uncle, grandma/grandpa, wife/husband, girlfriend/boyfriend). In case this update isn’t working for you, then it might be because this new feature seems to be geographically limited until now. Also you need to have English (US) set as your Voice Search language (Google Now > Settings >Voice). What are your favorite voice commands? I sure like the funny easter eggs! Share yours in the comments.